The Nutcracker is a great theme for a winter birthday or Christmas party. 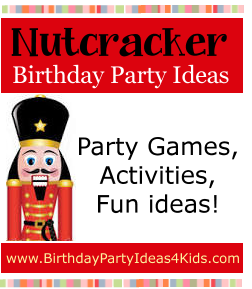 Nutcracker themed party games, activities and more ideas for planning the perfect Nutcracker party. Kids, tweens and teens of all ages will adore this birthday party theme! You will need foam swords, plastic coins or other round flat objects and two baskets for this game. The object is for teams to race one player at a time with a coin on the edge of the sword and place it in the basket. Divide players into 2 teams and give each team a foam sword and an equal number of coins. The first player in line takes a coin and places it on the sword blade and runs to the opposite side of the room and places it in their basket. They they run back and the next person in line does the same thing. Continue until one team has all of their coins in the basket. If a child drops the coin as they are running to the treasure chest they must pick up the coin and go back to their team and start their turn over. This game is played like the game freeze tag. One player starts in the middle of the play area as the Nutcracker. All the other players are the mice. The mice run around the Nutcracker and try not to be tagged by him. If a mouse is tagged by the Nutcracker then they have to freeze in position. They can be unfrozen by another mouse tagging them. The Nutcracker tries to get all the mice frozen at once. Then a new Nutcracker is chosen and play continues! The object of the game is to decorate a team member like a Christmas tree using all the objects given to each team. One player stands across the playing field from their team and puts their arms out. The other team members, one at a time, race back and forth with decorations and hang them on the human tree. First team to use all their items to decorate their tree and are first back to the starting line wins! Some fun ideas for decorations – red and green play balls that the tree has to hold, hula hoops, stick on foam Christmas decorations … anything crazy and fun! Each team will need two bowls. One that is empty at the other end of the playing field and one that is filled with kisses. The first person on each team will put on the mittens, take a kiss out of their bowl, run to their empty bowl and drop off the kiss, then run back to their team and give the next person in line the mittens. The first team to transfer all of their kisses wins. Tip: Place the same amount of kisses in each bowl and enough that each player gets 3 turns. This is a fun game because the mittens make it hard to pick up the kisses. Paint wooden Nutcracker statues and let the guests take them home as a party favor after the party. In honor of the Gingerbread Men of the Nutcracker let party guests have fun decorating their own gingerbread house or large gingerbread man cookie. Set out bowls of small candies like skittles, dots, gumdrops, etc. to decorate the houses and / or cookies. This activity is better when done at the beginning of the party so the gingerbread items will have time to dry a little before they are taken home.